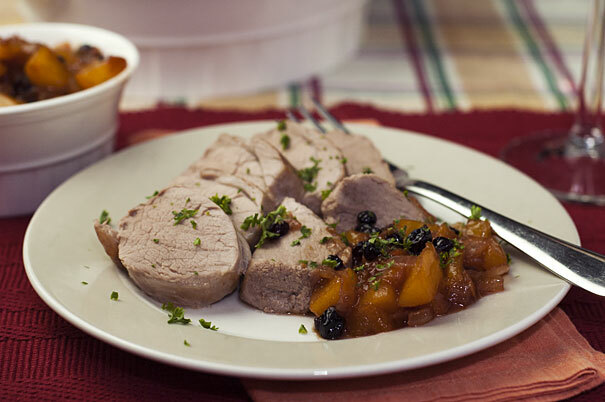 This pork fillet with peach chutney is easy to make and perfect for family or guests. Heat the butter in a frypan and cook the onion until translucent. Add the peaches and saute for five minutes before adding the sugar, carrants, fennel seeds and vinegar. Stir well and reduce heat to a simmer, stir occasionally for 20 minutes. Just before taking off the heat, stir in the parsley. Place in preheated oven for 20 minutes, turning once or until done. Rest meat for 10 minutes, then slice and serve with peach chutney.